Ted Yoder is today’s guest, joining us on the Join Up Dots podcast interview. He is a master of an instrument that until recently I had never heard off, but upon stumbling upon some information on the web, I knew that I wanted to have him on my show. Mr Ted Yoder got to the top of the Hammered Dulcimer pile, when back in 2010 he won the National Championship, even though this was not an instrument that was on his radar even a few years previously. So what was it about this instrument that really spoke to him, and allowed him to become a musician full-time, travelling the country performing well known classics, with a unique twist. Well let’s bring onto the show to start joining up dots, as we discuss the words of Steve Jobs with the one and only Ted Yoder. How when he was a child he always wanted to be the new Billy Joel or Eton John! 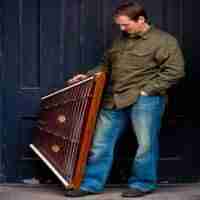 How he heard the instrument firstly on a Rich Mullins recording and was fascinated by its tone! Why he grasped the chance of living his dream life after a terrifying motor accident with all the family! How you only need to look at Ed Sheeran to see the steps that lead to success! How there are always going to be fears in your life, but it is how we overcome these that lead to success!